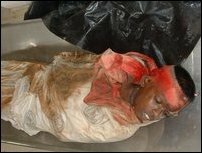 Two children and their grandfather were killed and the remaining two children with their mother were seriously wounded when Sri Lanka Navy (SLN) gunboats opened fire on them, Thursday early morning at 4:30. The fate of the refugee-family from Ira'naimaatha Nakar in Naachchikkudaa, located 40 km northeast of Mannaar, ended in tragedy in the seas off Peasaalai. Whereabouts of the father, Jim Maximus, is not known, although some reports said he has been handed over to the Police in Thalaimannar. 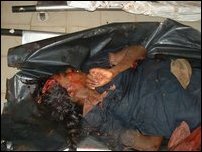 Pushpamalar Maximus, 37, the mother, seriously wounded with her two remaining children, is caught in trauma. Mr. Jim Maximus, whose efforts to notify the attacking SLN that they were innocent civilians ended in vain and he jumped off the boat and swam towards the gunboats in his attempt to save his family, the seriously injured 37-year-old mother told authorities before falling unconscious at the hospital, medical sources said. 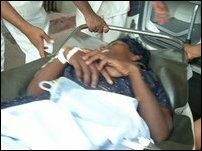 Pushpamalar Maximus, and her two children, 10-year-old boy Milakshan and 8-year-old girl Mithusini, all of them with serious gunshot wounds, were admitted at Mannaar hospital, at 10:30 a.m., five hours after the attack by the SLN. Dead bodies of Jebmaalai Jesudasan, 55, the grandfather and Mary Milakshani Maximus, 15, and Dilakshan Maximus, 11, have been handed over to the hospital mortuary. The children and their mother were in unconscious state at the hospital. The SLN has claimed that the civilian boat was caught in cross-fire. Naachchikkudaa is a coastal village located 40 km northeast of Mannaar in Liberation Tigers of Tamileelam (LTTE) controlled Ki'linochchi district. Jesudasan Jebamaalai, 55, the grandfather.